It's good to join an association of people who don't need to ask "But Why?" when told about a long-distance walk. I thought that by the end, I might be able to answer that question concisely and cleverly, having had a very long time to ponder it, but the reason is still something elusive, and inexplicable to those who have to ask. 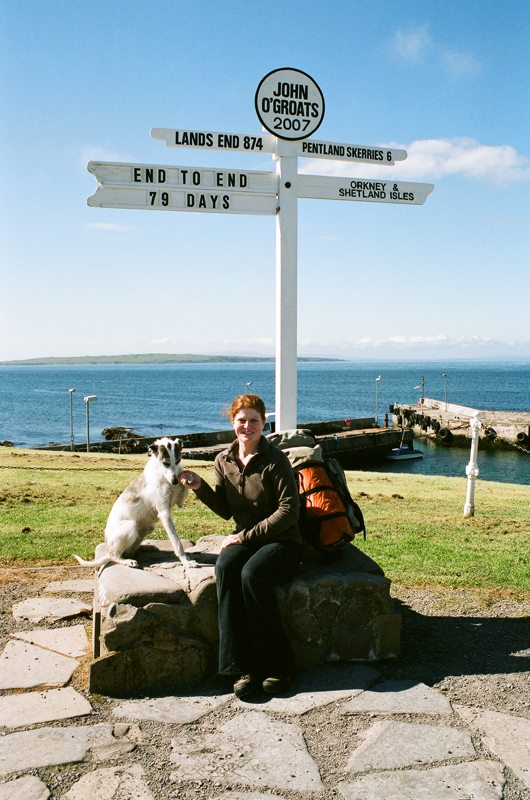 I walked from Land's End to John o' Groats from 1st of April (April Fool's Day seemed delightfully appropriate!) to 18th of June 2007, unsupported, with my dog Millie. We had 73 days of walking, 6 rest days, and covered about 1,146 miles. I used the route from Andrew McCloy's book, and ordered 55 second-hand Ordnance Survey maps from Amazon, as well as books by other walkers: John Hillaby, Hamish Brown and Shirley Rippin. Once in England, I spent a week in Cambridge, my birthplace, with my cousin, preparing boxes of supplies to collect en route, and visiting rescue centres and searching online for dogs needing a home. 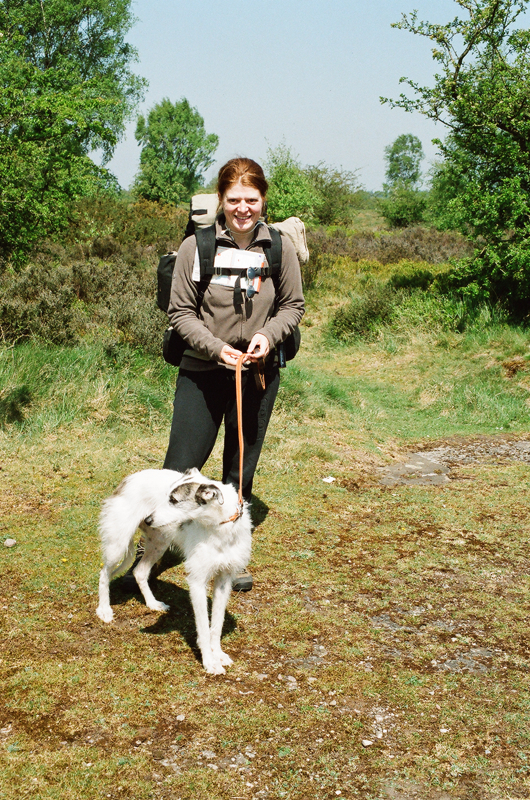 At the end of the week, I still hadn't found a dog, and was facing the difficult prospect of walking entirely alone – a possibility I hadn't considered and didn't much like the thought of. Millie was "chosen" in a phone interview two days before I began. The ladies emailed me a photograph of her and assured me she had the ideal temperament and build for the journey. I gambled, and took a long train ride to Chester, where I was handed my new dog, complete with collar, lead, a small bag of food, and some poo bags! I handed over my reference letters, and we got back on the train for another long ride (8 hours) to Penzance. Millie is a small, rough-coated lurcher, mostly white with brindle patches. She was an angel from the start: completely accepting of me, and curling up on the floor of the train with no complaints. 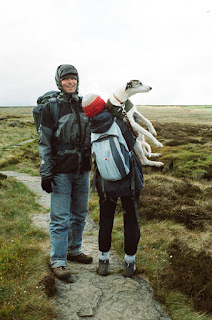 We spent the night before the start, camping outside Penzance Youth Hostel, and had a very messy time of it: I spilled a milkshake, Millie threw up her supper, and she turned out to be in season and bled on my camping mattress. Not a very promising beginning! 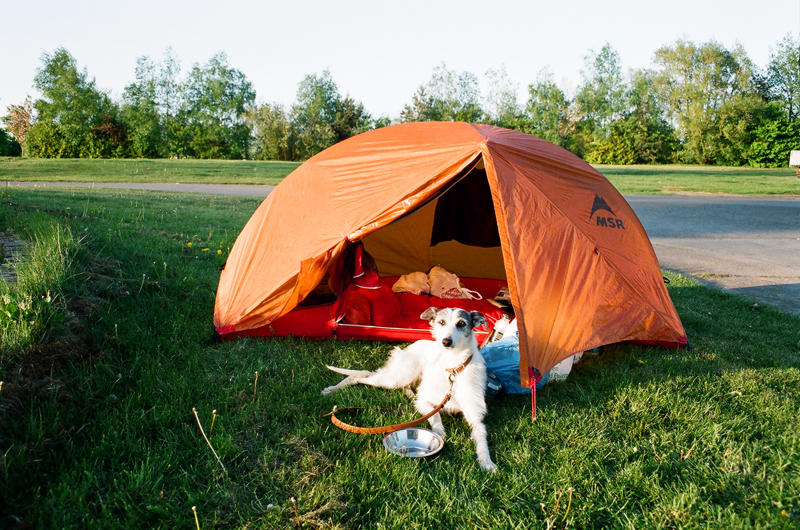 Millie outside my one-man MSR tent. In the second week, Millie pulled a muscle in her shoulder, and we rested for 3 days, luckily in a dog-friendly B&B close to a vet. By this time, she had unfortunately developed some separation anxiety, and on the 4th day, just before we were due to set off again, she jumped out of an upstairs window to get down to me! Amazingly, she seemed unhurt, so we continued, but took it easy for a few days. Although it wasn't the focus of my walk, I raised money along the way for Hout Bay PETS (Proactively Educating, Treating and Sterilizing), a program which spays and neuters pets in informal settlements, and also funds vet care for cats and dogs who otherwise wouldn't get treatment. We camped in campsites for most of the 12 weeks, but sometimes stayed in dog-friendly B&Bs, and camped wild on five occasions, which made me feel scared and unsafe. I had a mobile phone so I could keep in touch with my cousins in Cambridge and my husband at home. My husband Patrick was a wonderful support, often googling for dog-friendly places to stay when I couldn't find a campsite. And of course, he looked after our pets and home while I was gone. Each week I collected my poste restante box of camp-food, maps and tube of SPF 100 sunscreen (!) from a post office, and also letters from my family. I didn't have much of a chance to help Millie with her separation anxiety, and she would howl when I left her outside shops. She chewed through two leads, and had the vice of sheep-chasing. As we walked right through lambing season, I rarely let her off the lead. Happily, there are no sheep in Hout Bay, and Millie now contents herself with the less life-endangering sport of guinea-fowl chasing. 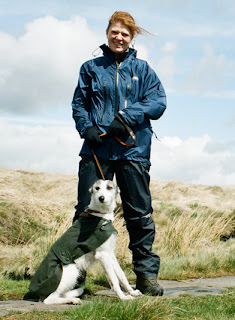 My cousins joined me for the first week of the Pennine Way, and got me cheerfully through the first difficult walking I encountered, and the first rain after a month of sun! This trip was my first journey north of Edinburgh, and I loved the unfamiliar landscapes and the wild, isolated emptiness. Our final leg into John o' Groats was a glorious sunny day, and I almost floated into the village, feeling like the luckiest woman alive, and full of excitement to see Patrick again after a long 3 months apart. 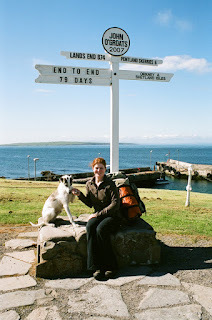 We celebrated in the Orkneys, with a blissful and lazy week at Backaskaill B&B on Sanday Island. The flooding began the next week (wasn't I lucky?) and although our night ferry to Aberdeen was unaffected, we had a difficult time getting south of Sheffield on the train. Eventually we arrived back in Cambridge in time for my cousin's wedding, and a mad rush of paperwork to get Millie ready to emigrate. Amazingly, it all fell into place just in time, and she flew over the same day we left. Millie settled in right away on a new continent with our other (male) dogs and cats. She amazes me; it took me far longer to adjust to being home, and the responsibilities of normal life. Patrick and I are expecting our first baby in March, and I am still walking Millie to keep us both fit (although not quite so many miles each day!). She loves being off-lead and running on the beach, and her latest unbelievable feat has been to squeeze herself through our cat door! I would like to thank my husband, for giving me the freedom to take the trip. Thank you also to Companion Care Vets in Cambridge, whose "can-do" attitude helped us race through Millie's paperwork, my cousins Kate & Nick and Rachel & Nick II, for posting my boxes and walking with me in the rain, and lastly all the dog-friendly B&Bs who welcomed Millie and me on so many exhausted evenings, with a soft bed and a cooked breakfast. 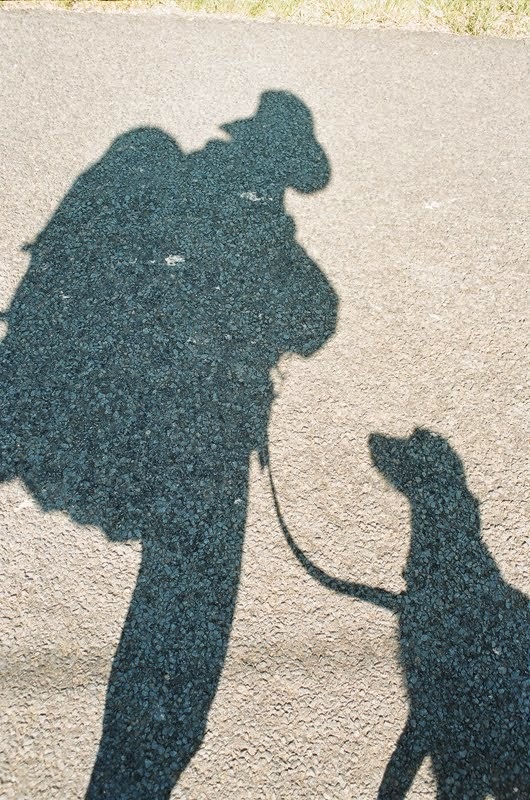 Walking with my dogs is the simplest and most joyous part of my day, and the chance to do that, and nothing but that, for three months of my life (regardless of any pain, exhaustion, frustration and fear that go along with such an adventure) makes me feel very privileged. I loved setting out early and savouring the slanted light and the dawn scents of the countryside. Not many people get the opportunity to make this beautiful journey.